I was curious on what types of maps would be anyone's interest. I am like a stray dog, lost in between what I do and what I should do. But sometimes, all you need is Imagination. i like large ones. there longer, typically a bit more intricate. If I had to pick for single player I'd probably say medium. In large maps, I sometimes lose my bearing of where I am and where I had to go. Small maps are over to soon. For multiplayer, I would probably pick medium as well. A lot of the newer custom single player maps are pretty amazing and well thought out but they're also gigantic, and I lose my direction. 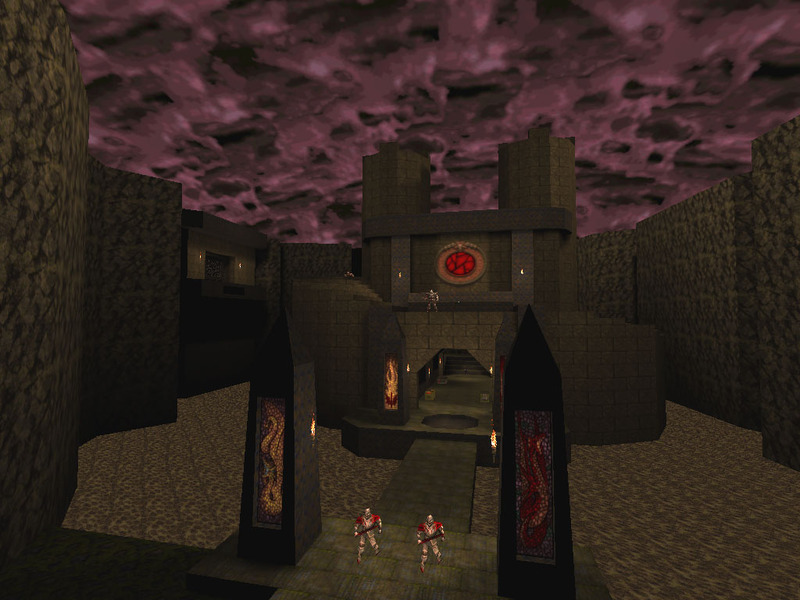 When you say that original Quake maps are small, then I like the medium ones the most. Like it already has been mentioned, large maps can tend to make you lose orientation/focus/goals. Of course, there are always the map-types that lead you like a tunnel from beginning to end. These kind of maps (where you do not have to re-visit areas a couple of times) can be as large as possible, because you cannot get lost. But the ones that needs to re-visit several places, need some orientation marks. Just like maps from sock and others have ! They add signs and stuff into it to make it clearer. Quake (speaking from original game idea) is a faced paced shooter game with narrow passages and linear playthrough most of the time. Expending this idea (and make it open-world like) has some risks and to avoid that you need a smart traveling system while mapping (some signs or hints or a cinematic clip when pushing a button that shows you what just happened and where). PS: I was talking about Single player of course. Multiplayer maps are always cube like. I voted medium, but with an exception: if a large map is linear, open, and action packed, then that would be my favorite. Not a labyrinth of tight hallways and what not, I get lost too easy. Obviously everyone's all over the board. A good balance would probly be an episode containing all, each with its own combat dynamic. A small map, for instance, would be dark and terrifying, with low ammo and health and shocking monster encounters. This usually makes the map seem longer than it really is. The next map could 've more open and more combat oriented. IF IT DOESN'T SUPPORT 8V8 TEAMGAMEPLAY , MOSTLY IRRELEVANT TO ME. Considering I enjoy the interaction of PvP/Team orienteted gaming,and not playing with myself heavily over and over. So you like em big huh? IF WE CAN'T FIT 16 MAFAKKAS IN THERE AT ONCE,WE GONNA BREAK IT. Oh, just noticed we're gabbing on about singleplayer. like i personally really like big maps with a lot of exploration, but my fave theme in maps is medieval and i love temples. I picked medium, I was thinking more for multiplayer maps, but for a single player map or a coop server map then definitely large. I prefer the large maps... Why? I enjoy exploration... In my opinion, a game without exploration is kinda like ice cream without the cream.